York University Professors Gabrielle Slowey and Joan Judge were awarded Massey College appointments for the 2018-19 academic year. 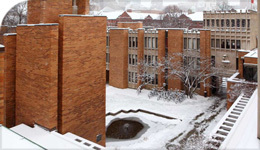 Massey College is an independent college situated on the University of Toronto campus. Visiting scholars will have a study space in the college and access to all the same privileges as the Massey College senior Fellows. Membership in the Massey Alumni Association is granted to visiting scholars at the completion of their program.